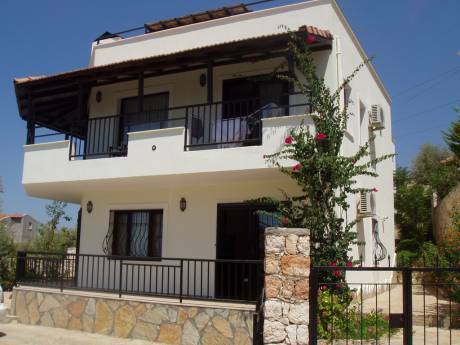 We offer a superb, bright and sunny detached 3 bed villa with private pool, the villa is fully air conditioned and has wonderful terraces and balcony with beautiful mountain views, in a peacfull location but close to amenities. The swimming pool is for the sole use of our guests, beautiful gardens surround the villa offering a variety of palms, flowers and trees. Sun loungers and seating enables you to unwind in peace and quite. There are two double beds and one twin. Both double rooms have a private balcony. The upstairs bathroom has a jacuzzi bath and shower. There is also a down stairs toilet. The living area is open plan and has the benefit of opening on to terraces, modern and clean furnishing through out, the lounge has a modern sofa which can be used as a double bed, coffee table, TV/SAT (english chanels) and DVD Player, adjoining the lounge area is a modern dinning room table and six chairs. The kitchen is fully equipt with fridge/freezer, microwave, oven and hob, toaster and kettle. The gardens and pool have sun loungers and parasols, thus the terraces have good quality table and chairs for al-fresco dining, the whole area and pool is lit at night. Private parking for 2 cars if required. We are a professional family that work extremely hard thus enjoy a quite, relaxing holiday, however we have 4 children of 23, 19 14 and 10. We chose Ovacik because of our different interests, so we could all enjoy ourselves, I love the pool and a good book, good food and sight seeing, thus ditto for my husband,- the book! My daughters when back from uni like clubbing and shopping and the beach, my husband and sons are diving fanatics, thus all needs are met! 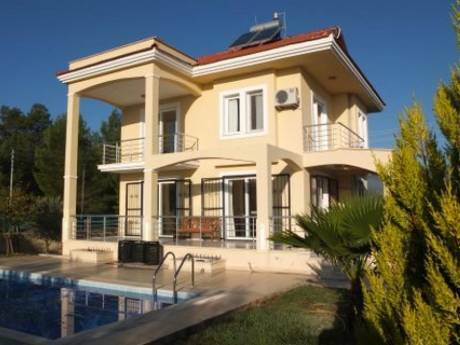 Chantal and Mark, Rebecca, Rachelle, Alexander and Rhyce welcome you to our beautiful villa in Turkey. Ideally located in a peacefull location, but close to an array of activity. The nearest supermarket and restaurant is 5 minutes walk. Paragliding, is the largest sport here, but horse riding, diving, micro-lighting, white water rafting, and many more activities available. The nearest beach is Olundeniz, the famous blue lagoon,(the sunset is stunning!) is only 10 minutes away on the local Dolmus(bus) Fethiye is also 10 minutes away, and offers an abundant amount of restaurants, markets and shopping all year round. Hisaronu is walking distance, a resort in its own right that also offers restaurants, shops, shops and more shops, beauty therapy, massage and hair dressing is a real bargin, and Turkish baths are found all over. The whole area is surrounded by the Mendos and Babada mountains, stunning scenery all year round. The local people are friendly and helpful. Most speak English. This area is for all ages, as it offers so much and such a wide range of things to do, even if you are in your 60-70s you will enjoy what this has to offer.